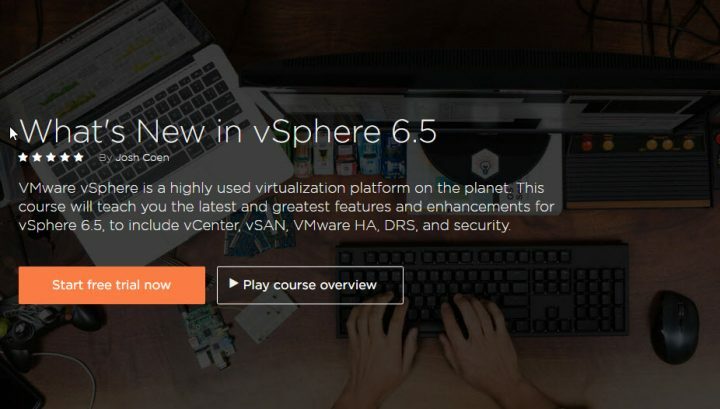 There is a new training course available at Pluralsight with as a topic What’s new in vSphere 6.5. The author is Josh Coen (@joshcoen), a VCDX certified, cloud architect, working for Sirius Computer Solutions, a national systems integrator. Josh has been working in the industry for 15 years, specifically with virtualization and storage. Readers of our website know that vSphere 6.5 is a large topic. To become VCP certified becomes harder and harder for folks that start with VMware certification process. Good quality courses from Pluralsight are a good investment when learning towards VCP exams. I can confirm from my own experience as I used those resources to pass my past VCPs and VCAPs. Pluralsight allows you to get a subscription to learn at your own pace. If after the learning process has finished, and you passed your exam, you can cancel anytime. It is a monthly subscription plan, which you can get details here. There is 10 days free trial (then $29/month). Let’s see what Josh Coen says about the course. With each new release of vSphere, both major and minor releases, existing features are enhanced, new features are released, and trying to keep up with all of it can be challenging, especially during the major release cycles. In this course, What’s New in vSphere 6.5, you’ll be introduced and walked through all the major enhancements and features to vSphere. First, you’ll learn about the new features in vCenter and VMware HA and DRS, both of which bring major improvements. Next you’ll discover what’s new and exciting with vSphere Storage, which include enhancements made to vSAN. Finally, you’ll learn about what’s new with VMware Update Manager and vSphere Security, both bringing long awaited feature requests into fruition. Once you complete the course, you’ll be completely up-to-speed on all major features introduced and enhanced in vSphere 6.5. Screenshot from the Pluralsight website. From my own experience so far, with vSphere 6.5 I can recommend several posts where I documented things I’ve done in the lab. I proceeded and tested several different migration methods to migrate vCenter server to the latest release (note you can’t migrate vCenter 6.5 to VCSA 6.5, know that…). I also migrated my ESXi hosts running VMware VSAN. I tried different migration methods for those ESXi hosts and documented the steps. But the lab got migrated to vSphere 6.5 with VCSA 6.5 (Photon OS). Part of it is also VUM now, so the All-In-one package is quite sweet. There were problems to find good driver/firmware combination for my x710-DA2 10Gb NICs, but finally, the latest driver and latest firmware with uninstalling the stocked VIB from the VMware ESXi 6.5 iso did the trick. VMware technologies are still the mainstream when it comes to data center virtualization. VMware Virtual SAN is gaining momentum (recent stats showed over 7000 VSAN customers) as it’s simplicity in management, together with good performance allow to take the benefit for predictable performance at scale. VMware and IT administrators need to master those technologies to become more performant in their jobs. 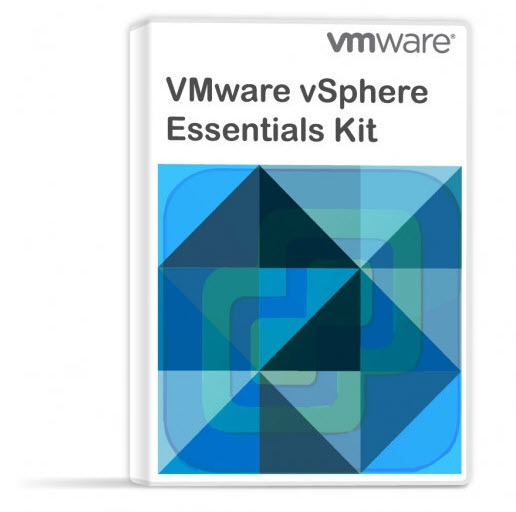 as a result, the knowledge is evolving with every release of VMware vSphere. The current release of vSphere is no different. Tons of new features added. Only now we can see the backup/replication and monitoring products to catch up and become compatible. The adoption of the new release of vSphere isn’t fast and it’s normal as one of the politics for the upgrade is to wait for “Update 1” service pack. The latest release of vCenter server is labeled vCenter server 6.5b so it is already the second patch after the initial vSphere release last fall. What is VMware Storage DRS (SDRS)? Once you get to Pluralsight, seek for “vSphere 6.5” course in the search window and click on the Start free trial button. Note: At Pluralsight, they offer a free trial for monthly and annual individual subscriptions. With that free trial, you have 10 days and/or 200 minutes of access to their content. If you do not cancel your trial within the 10 days, your trial will automatically convert into a paid subscription. Within the trial, once the 200 minutes has been used, you will be prompted to renew your subscription. You can either convert your free trial to a paid subscription through your Subscription & Billing tab on your Account page, or you can send an email to their support in order to reset your trial minutes (200) which you can do only once. You shown the specs for a home lab to study. But now all seem to be unusable. I was able to upgraded vCenter 5.5 to 6.0 then 6.5U1. But when upgrade the ESXi 6.5U1. It sais incompatible! Very sad ! I think my setup will no more usable to learn ! Have you got any followers same issues? Do you have a solution other than upgrade our hardware? Thank for your blog, it helps me a lot. By the way i m registered to Pluralsigh for 1 yr.